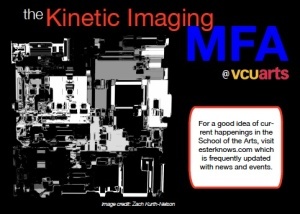 Virginia Commonwealth University is located in the raging art scene of Richmond. It’s a city awash in galleries and show opportunities, which are a fine accompaniment to the Virginia Museum of Fine Arts. When the need arises to spread one’s wings, Washington D.C., the Chesapeake, and New York City are all easily accessible. 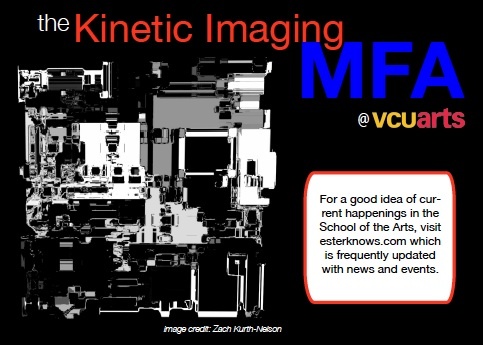 Each of their MFA students has studio space in VCU’s Fine Arts Building, which facilitates interdisciplinary study with our top-ranking Sculpture and Painting & Printmaking departments. Their graduate program is a 60 unit, two-year program of residency. The curriculum is streamlined and focused: each semester the student is required to take graduate seminar, graduate studio, and one elective. To reinforce an interdisciplinary methodology, they encourage students to interact with VCU’s other graduate programs. Their undergraduate program consists of 100 undergraduate students studying video, animation and sound. They encourage the graduate students to participate in the undergraduate by working as a teaching assistant or acting as a mentor. members. The committee will meet twice in the first semester with the graduate student. The student is expected to continue with research, with 2 formal committee meetings. done in consultation with the graduate advisor. given to each graduate committee member one week before the exhibition. Applications and portfolios must be submitted online by January 15.